Genetics. The animal's genes dictate the colour of their fur. Differences in colouration are the result of varying amounts of pigments, called melanin, laid down in the hairs as they grow. The ‘normal’ colour morphs of Grey and Red squirrels owe their appearance to hairs that are banded with light and dark pigments; a mixture of hairs with different coloured bands make up the overall pelt colour and pattern. White individuals can be albino, although these tend to be rare, leucistic, or simply fail to deposit any pigment in their hairs. Black individuals, by contrast, have increased melanin deposition. In black Grey squirrels, a faulty gene causes the hormone that would normally switch pigment production off to switch it on instead, resulting in a continual production of melanin. It is important to recognise that, although different colours, they are not different species. Black squirrels are simply black-coloured Grey or Red squirrels. In squirrels, like all mammals, coat colour is under genetic control. The animal’s genes control how pigment is deposited into hair strands and, therefore, what the end result looks like. To understand this a little better it is necessary to take a brief foray into the fascinating world of genetics, embryology and physiology. As adults, our bodies are made up of about 10 trillion individual cells, most of which contain 46 strands of deoxyribonucleic acid – a long chain of building blocks, the name of which is frequently (and understandably) shortened to DNA. These 46 strands are called chromosomes, you inherited 23 from your Dad and the other 23 from your Mum, and within them lie the ‘blueprints’ for building another you. Chromosomes are—figuratively speaking—divided into individual points, or sections, called genes. These genes contain the details (the ‘instructions’ or ‘code’, if you like) for how to create proteins, which go on to form your tissues and control many biochemical processes within your cells. Your genetic blueprint, or genotype, not only codes for building proteins, it is also largely responsible for determining how you look: your physical appearance, or phenotype. Now, a given gene may have several different forms, variations on a theme if you will, each of which may produce a slightly different end result – we variations of the same gene alleles, and they’re caused by mutations in the coding of the gene when it is made. If this is all starting to get a bit complicated, think of our building analogy. To build our house we have a main set of plans (genotype) that specify how it’s going to look (phenotype); how many doors or windows and where they’re positioned, for example. We also have our factories (genes) that churn out our building materials, the bricks, mortar, wood, nails, screws, plaster and so forth. Importantly for answering this question, not all brick factories are the same, some churn out bricks of different sizes, shapes or colours – these are our alleles. If our blueprint includes instructions for using an allele producing green bricks rather than red ones, we’re going to end up with a green house. It looks exactly the same as the red house next door in terms of its size and layout, it’s just a different colour. The final concept to get our head around is that some of these ‘factories’ are better at muscling their bricks into our building than others; some are dominant over others. Unfortunately, here’s where our brick analogy starts to break down, so I’ll turn to something else – a very basic, green fingered, example based on the pioneering work of the late world-renowned geneticist, Gregor Mendel. Let’s say you’re growing a sunflower; if external inputs (food, water, sunlight) remain the same, how tall your plant grows will depend on its genes. For our basic example, we’ll assume that the plant will either be tall or short. If a plant is tall, which we’ll assume is the normal condition, it has the ‘tall allele’ and we’ll abbreviate this to “T”; if it’s short then it has a mutation of the tall gene, the ‘short allele’ “t”. The tall gene is dominant over the short gene, which we call recessive. This means that where T and t are present, T should ‘win out’ and the plant will grow tall. Recall that there are two sets of chromosomes, one from Mum and one from Dad, so we can see that TT or Tt will lead to a tall sunflower, while both parents donating a t (giving a tt combination) will result in a short sunflower. Assuming these alleles are equally common, our sunflower has a 66% change of being tall and a 33% chance of being short. In cases where one parent contributes a dominant allele and the other provides a recessive one (i.e. Tt), the individual is called heterozygous (from hetero- meaning “different”). Where both parents provide the same allele (i.e. TT or tt) the individual is homozygous (homo- meaning “the same”). This works well for our very clean example, but it is worth mentioning that nature is seldom so straightforward and sometimes we see a dominant and recessive allele ‘holding their own’ in each other’s company, and we end up with an intermediate phenotype; our sunflower is medium height. We call this incomplete dominance and it’s a bit like mixing coloured paints. If you mix red and yellow paint together you get a colour in between the two: orange. Why have I gone over all of this? Partly to introduce the terminology that we’re going to need to explain the different coat colours of squirrels and partly to make a point. The term mutation is frequently associated with somewhat macabre connotations; two-headed fish, The Fly, ninja turtles and so forth. In genetic terms, though, a mutation is simply a change to the genetic material; the change could be for the better, for the worse, or it could have no impact either way. So, when we talk about mutations leading to the differences in fur colour, we’re not talking about a comic book style Radioactive Man (Radioactive squirrel!). Instead we’re referring to a change to the gene which has caused a different colour or pattern to be produced. Some of the first studies looking at the genetics of coat colour in squirrels were done by German biologist Herbert Wiltafsky as part of his Ph.D. thesis at the University of Köln in the early 1970s. During his captive breeding studies, Wiltafsky found that the colour of the fur on the lower legs and feet of his Red squirrels was determined by a single gene with a dominant ‘red’ and recessive ‘black’ allele. Wiltafsky also observed that that foot fur colour wasn’t related to either the colour of the back or the tail. This suggests that the overall colour of a squirrel’s coat is not controlled by a single gene, but is instead under the influence of several genes or alleles – genetically-speaking, it is polygenic. Even today, some four decades on from Wiltafsky’s studies, we have very little data on squirrel coat colour and there is still much to be learnt about the genetics of their coat colour. We have, nonetheless, made some important steps forward in recent years. We now know that the MC1R gene plays an important role in fur colouration in vertebrates and that there are two crucial components: the MC1R receptor (note lack of italics) and the ASIP protein, sometimes referred to as the agouti protein. Fortunately, we don't need to know what these components are, or what they acronyms stand for to get an idea of how colour changes come about. Mammals possess a fairly small selection of colour pigments; perhaps the most well-known are the carotenes and melanin, and it is the latter that interest us here. Melanin can be divided into two main types: eumelanin, which is black or brown, and phaeomelanin, which is paler, ranging from red through to yellow. (Technically, there’s a third, neuromelanin, but this is found only in some brain neurons.) The cells that secrete melanin are called melanocytes and the MC1R gene is responsible for regulating its production by these cells. The animal’s genes affect the melanin production in two ways: because they control how the body is built, they also control where the melanocytes end up in the skin and, therefore, affect colour patterns; they also switch melanin production ‘on’ and ‘off’ in the melanocytes, thus controlling how much pigment is applied and the overall colour strength. The white underside of many mammals, for example, occurs when melanocyte activity is suppressed and no, or very little, pigment gets added to the hairs. First things first: how does hair become pigmented in the first place? Hairs start life as a hair bulb, produced in small sac in the skin called a follicle. How the follicle forms is remarkably complicated, and controlled by many different genes, but the essence is that a hair shaft is formed within the follicle, growing up and out of the pore like a plant bulb sends its shoot up through the soil. As the hair grows, the follicle’s melanocytes (called neural crest melanoblasts, we’ll see why later) secrete melanin, which is deposited in the hair shaft and transfuses into the hair’s matrix. The end colour of the hair depends upon the type and pattern of the melanin within. As the hair grows, the melanocytes are switched 'on' or 'off'' under the control of hormones that activate the MC1R and/or ASIP receptors. I won't go into the biochemistry, but basically the type of hormone that activates the MC1R receptor dictates whether eumelanin or phaeomelanin is produced by the melanocyte. Pulses of melanin production as the hair grows leads to a banded appearance; when the melanocytes are ‘on’ they’re laying down pigment; when they’re ‘off’ no pigment is infused into the growing hair. The existing data we have on squirrel genetics suggests that it's the MC1R gene that plays the most significant role in squirrel coat colouration, although in other mammals (and perhaps to a lesser extent in squirrels too) the agouti gene is in control. Scientists at the Oak Ridge National Laboratory (ORNL) in Tennessee, for example, have discovered that mice born without the agouti gene are totally black, while those born with a mutated allele (the ‘non-agouti’ gene) that is ‘always on’ are totally yellow. The reason for this is that when the gene is ‘on’ it causes the secretion of the agouti protein, which stimulates the melanocytes to produce phaeomelanin, leading to a pale yellow band in the hair; but, when it’s ‘off’ no protein is present and the melanocytes return to producing eumelanin, so a dark band is deposited. In tree squirrels (those of the genus Sciurus), we see considerable variation in coat colour. Both Grey (S. carolinensis) and Red squirrels (S. vulgaris) exhibit white and melanistic (black or very dark) forms, called morphs, as well as their wild-type (normal) colouration. So, can we be a bit more specific as to what causes these different pelage colours? Well, geneticists consider that all variation from the wild-type arises through mutation and, although the precise mechanism(s) of melanin deposition in squirrel hair is still unclear, it seems probable that it follows the process observed in other mammals. In order to best understand the occurrence of black and white morphs, we first need to understand what makes wild-type squirrels grey. Recent research by Helen McRobie, Alison Thomas and Jo Kelly, at Anglia Ruskin University in Cambridge, has provided an insight into how squirrel colouration works at both a physical and genetic level – their findings were published in a paper to the Journal of Heredity during 2009. The researchers collected hair from the back, sides and belly of 34 Grey squirrels representing all British colour morphs and subjected them to microscopic and genetic analysis. It transpires that each hair could be categorized into one of seven distinct groups, or 'types', according to the pattern of pigmentation (from all black, through various bandings to all white) and that each colour morph had differing amounts of each hair type. Wild-type grey squirrels have six of these hair groups that together provide the grizzled-grey appearance. In other words, the normal grey fur is actually a subtle blend of six different hair types, each with a different pattern of black (eumelanin), orange (phaeomelanin) and white (pigmentless) banding. Black morphs of both Red and Grey squirrels are known, although black Reds are very rare in the UK and when most people see a black squirrel in Britain it is a black morph of our ubiquitous Grey. Until recently, black Grey squirrels (hence forth, just “black squirrels”) were something of an enigma; even now they are becoming increasingly common in England, they still draw great public interest. Black squirrels are relatively common elsewhere in their range, particularly in North America, and some towns even have them as mascots. The first black squirrel to be recorded from the wild in Britain was seen in the small town of Hitchin, north Hertfordshire during 1912 and this enigmatic morph appears to have spread north and eastward since; they are now relatively common in counties such as Cambridgeshire and Bedfordshire, where they are at least as common as grey morphs in some parts. Quite where these black individuals came from is uncertain, although genetic data collected by the Anglia Ruskin geneticists suggest that the initial animals were escapees from zoo collections imported from the USA. Before we go on to look at the reason these squirrels are black, it is important to be clear that these are not a different species to the normally-coloured grey squirrels; they’re simply a different coloured 'version' of the grey squirrel. Jet-black squirrels have only one fur group, pure black, and are the result of hypereumelanogenesis – in other words, there is an excessive production of eumelanin that makes the entire hair black. The recent work by Helen McRobie and her colleagues suggests that this is a mutation of the MC1R gene. The researchers found that jet-black squirrels had a section of the MC1R gene missing. In genetic terms, these black squirrels had a 24 base-pair deletion – the specifics aren't important to understand here, but it basically means that the MC1R protein is shorter (by eight amino acid sub-units) in black squirrels than in grey ones. Essentially, this mutant MC1R gene 'locks' the melanocytes ‘on’ and sets them to produce only eumelanin. Normally, two hormones are produced, one that turns eumelanin production on and another that turns it off; this mutation means that the hormone normally responsible for switching melanin production off turns it on instead. Some squirrels that appear black from a distance are actually dark brown in colour. The Cambridge biologists found that these morphs had four of the hair groups, arranged in various combinations, on their back, sides and belly. The reason for this particular morph brings us back to the phenomenon of incomplete dominance. We mix red and yellow paint and we end up with a colour intermediate between the two: orange. This is a basic example, but the same principle occurs when a grey and jet-black squirrel mate: they produce a brown kitten. So, the black gene is incompletely dominant because you need two jet-black parents for a jet-black kitten. If a black and brown squirrel, or two brown squirrels, mate they have a 50:50 chance of producing black kittens; a mating between a brown and grey animal could produce only grey or brown kittens, with a 50% chance of each. In Britain, we tend only to see wild-type (grey), jet-black and white morphs but, in North America, some black squirrels have 'frosted' appearance, while others were more subtly 'graded'. In their 1958 paper to the Journal of Mammalogy, Pennsylvania State University biologists William Creed and Ward Sharp divided their ‘black’ squirrels into three groups. Group 1 were most common in their study area of the Cameron County forests and exhibited black hairs with narrow ‘buff’ bands on their backs, which gave them a “brownish-black” appearance; their belly fur was predominantly a rusty-brown colour. Group 2 morphs were jet black except for a scattering of silvery-white hairs on their back and tail; their undersides were also black. Group 3 squirrels were totally jet black. This was actually the least common colour morph. The biologists reported that there were squirrels that didn’t fit neatly into any of the above categories. One animal in particular exhibited both melanism and erythrism (was red/ginger); the black hairs on its back had a red tip, giving an overall reddish-black appearance, and its tail was completely red. Similarly, during a study of Red squirrels in the Italian Alps, biologists found ‘red’, ‘brown’ (back and tail dark brown, lower legs and feet red or reddish-brown) and ‘black’ morphs. Indeed, it is worth noting that even within wild-type morphs there is colour variation, with some being paler than others. Interestingly the Italian scientists noted that, in their squirrels, regardless of the morph the underside was always white. This suggests that the situation may be more complex than a single defective or mutated gene and that different genes controlling back and stomach fur colour, in line with Wiltafsky’s observations discussed earlier. There are three reasons for a squirrel being white; it can be an albino, leucistic, or it can be what I shall call a ‘white mutant’. It is important to make the distinction between these conditions, because the underlying genetic causes are entirely different. The classification of albinism has changed considerably in recent years as the causes have become better understood. One of the most common types of albinism is “OCA1”, in which the sufferer possesses recessive alleles of a gene for the production of an enzyme called tyrosinase; the result is that the tyrosinase enzyme in the melanocyte doesn’t work. Melanin is the end product of a rather complicated biochemical pathway, the starting point of which is the oxidation of the copper-containing amino acid tyrosine – this oxidation requires tyrosinase in order to happen. Without tyrosinase the body cannot make melanin and the skin and hairs lack pigment, appearing white. The eyes also lack pigmentation and the blood vessels that are normally obscured by the melanin are visible, giving the eyes a red appearance. It should be noted that this is an all or nothing defect and, contrary to popular misconception, there is no such condition as a ‘partial albino’. When people refer to something as a partial albino, what they’re actually seeing is partial leucism. Leucism, on the other hand, is a form of hypopigmentation – a rare, presumably recessive, gene prevents melanin deposition within the hair. While albinos have melanocytes but just cannot use them, in leucistic animals the melanocytes are missing from the area of skin altogether. Not only does leucism have a different anatomical profile to albinism, it also has an entirely different cause. In vertebrates, the melanocytes start life as part of a bunch of cells, called the neural crest, lying along the spinal cord. During development, and presumably under genetic control, the cells break away from the neural crest and migrate to various locations across the skin. In leucists, the cells fail to differentiate or migrate from the crest and this affects production of all pigments, not just melanin. In some cases, some of the cells migrate, leading to patches with pigment and patches without – this is referred to as partial leucism. Often the easiest way to separate an albino from a leucist is by the presence of red eyes. We have seen that albinos can lack the ability to create melanin in any of their cells, so their eyes are typically unpigmented, appearing red because of the haemoglobin in the blood running through the capillaries of the retina and iris. Leucists have normally-coloured eyes and, although the reason for this is rather complicated, it stems from the origin of the retina during development. Basically, the retinal melanocytes (i.e. the pigment cells of the eye) don’t come from the neural crest; as the embryo grows, a small pouch develops from the neural tube that goes on to form the ophthalmic cup and the retina develops from this. Consequently, because the retina’s melanocytes aren’t from the crest, they’re not affected if the cells fail to migrate or differentiate. The third possibility, the white mutant, is theoretical and yet to be confirmed scientifically. Such animals are capable of producing melanin, so aren’t albino, and have melanocytes where it should, so aren’t leucistic. Instead, they’re white because their genes either prevent eumelanin being produced (i.e. melanocytes are permanently ‘off’) or promote only phaeomelanin production. In the first case the animal would be white; in the second the animal would likely be pale yellow/cream in colour. Given that the agouti gene is capable of making mice entirely black or entirely white/yellow, it seems possible a similar mutation in squirrels could yield similar results. There are several populations of white squirrels found throughout the range of S. carolinensis (white individuals of S. vulgaris are rare), particularly in the USA. One well known population of white Greys can be found in Brevard County, North Carolina; in this population there are a number of individuals that are totally white, except for a distinctive dark patch on their head and stripe down their back. The dynamics, ecology and genetics of this population are being studied by Brevard College’s White Squirrel Research Institute. Interestingly, biologists at the WSRI report that populations of white individuals tend to pop-up, die out and then re-occur somewhere else; this implies that the white morph may be a spontaneous mutation of the genes that control neural crest splitting or melanocyte migration (so-called “regulator” genes), or in genes that regulate the production of melanin. During the early 1940s, biologists noticed that melanistic squirrels tended to occur at the northern extent of their geographical range and suggested that having darker fur may be an advantage over other colours in wet, dense spruce-fir forests; providing warmth and camouflage. In genetics, there is a rule called the Hardy-Weinberg Principle, which states that if a particular genetically-controlled trait doesn’t cause disproportionate mortality, it will persist in a population. In other words, if the trait makes the animal more to survive and have young, or leave more young during its lifetime, the gene(s) for that trait will be passed down to subsequent generations; this keeps it in the population. The observation that many populations of black squirrels seem to do well in the wild suggests that the colour does confer some benefit. Indeed, there are more differences between these morphs than just their colour. A study of Red squirrels in Finland by zoologists Paavo Voipio and Raimo Hissa, based at the University of Turku, found that black morphs had longer and denser undercoat fur than wild-types, suggesting they were better insulated. Similar studies on Grey squirrels have shown that, at temperatures below minus 10C (14F), completely black morphs lose about 20% less body heat than grey morphs and have a lower basal metabolic rate. Overall, black morphs use about 10% less energy in these sub-zero temperatures than grey morphs. In recent years, it has been suggested that black squirrels are also larger and more aggressive than wild-types. There are, as far as I am aware, no data to support the claim that black morphs are physically bigger than grey morphs, although the difference in fur density could make black squirrels look larger than greys, and the theory that the black morph mutation is linked to higher testosterone levels has yet to confirmed. In a 1990 paper to the American Midland Naturalist, State University of New York biologists Eric Gustafson and Larry VanDruff reported the findings of their study on the behaviour of black and wild-type Grey squirrels between February 1982 and March 1983 in Syracuse, New York. Taking into account that there don’t seem to be any differences in the behaviour of the colour morphs, and leaving aside the idea that humans may persecute certain (more interesting/novel) colour morphs less than others, the theory that melanism provides a selective advantage in cold, damp climates seems the most plausible explanation for the perpetuation of the black morphs, particularly in the Red squirrel. One common observation of colour morphs is that animals in humid environments tend to be more highly pigmented than those of the same species in less humid environments; this idea was first documented in 1833 by Constantin Wilhelm Lambert Gloger during his studies of bird plumage, and is now referred to as Gloger’s Rule. Melanistic morphs of squirrels aren’t, however, found in particularly humid environments and it seems unlikely that Gloger’s Rule explains their distribution. Instead, it seems thermoregulation, the ability to maintain a body temperature above that of your environment, and camouflage may offer more plausible explanations. “We suggest that the combination of a denser and more cryptic fur in black morphs gives them a selective advantage over other coat colour morphs in wet, dense spruce-fir forests of the Italian Alps”. Why, then, do we see black squirrels in urban areas, where it’s not particularly cold, or humid and where they probably stand out more than grey morphs? Well, it’s entirely possible that there’s some other factor(s) that provide an advantage in urban areas that we have identified yet. Even so, it’s worth remembering that a trait need not be adaptive to persist, so long as it is not maladaptive. In other words, as long as it’s not a disadvantage for a city squirrel to be black, there’s no reason why they shouldn’t survive and reproduce. The idea of improved thermoregulation and camouflage over wild-type morphs in certain environments may explain the evolution of the melanistic morph, but what about white ones? White animals tend not to be particularly common in the wild; they stick out like the metaphorical sore thumb and such a striking lack of camouflage makes them more obvious to predators. In the case of albinos, however, being more obvious to things trying to eat you is just one of several problems. Albinos tend to have poorer eyesight than pigmented individuals. The lack of tyrosinase means the cells surrounding the retina that nourish and protect it are less well developed, which makes the retina more prone to damage. The retina is also, more generally, less well-developed in albinos. The rod cells on the retina, for example, need a chemical called dihydroxyphenylalanine (DOPA) to form properly, and tyrosinase is needed to make DOPA. Similarly, melanin is contained within the cells of the eye and absorbs light; without it, light entering the pupil scatters, flooding the eye with light and dazzling the retina. Overall, albinos tend to have fewer rod cells on the retina, a higher proportion of which have an abnormally low amount of the visual pigment rhodopsin, and may also have fewer connections between the retina and the brain. In sort, their vision tends to be very poor. 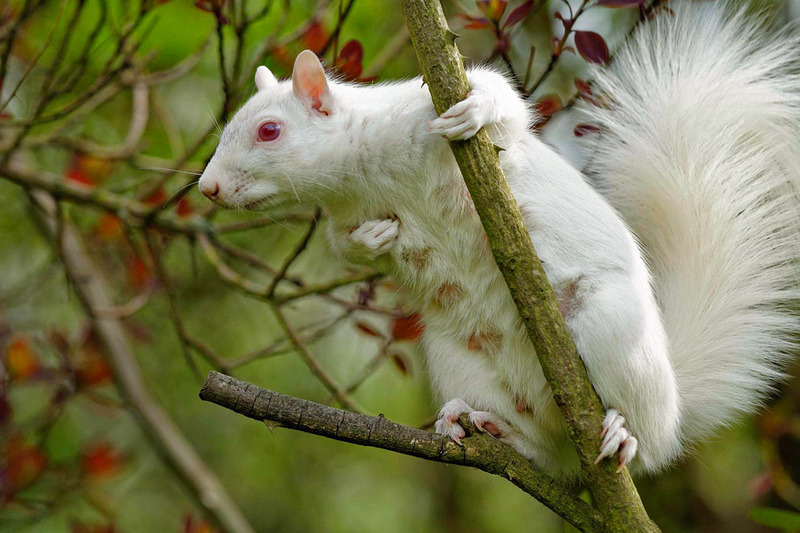 It’s not difficult to see how being easily dazzled or having generally poor eyesight could be a disadvantage for an animal that spends much of its time jumping around in trees but, as many observers have pointed out, white squirrels tend to retain much of their mastery of the treetops. In an interesting 1998 paper to the journal Vision Research, Glen Jeffrey at University College London and Jona Estive at Barcelona University reported that the eyes of the albino Grey squirrels they studied suffered only about a 5% reduction in the number of central nerve cells on the retina – this is in comparison to an average reduction of about 25% in most albino mammals. Unfortunately, Jeffrey and Estive’s analysis only involved two albino squirrels, but if their findings are representative of albino squirrels in general, they may explain why albino squirrels seem to do well in the wild. As well as the potential for less retinal degredation, there are some data suggesting that albino squirrels may also keep their ‘built-in’ sunglasses. Squirrels have a water-soluble yellow pigment in the lenses of their eyes that has two peaks of absorption in the ultraviolet: one at 265nm (UVC); the other at 370nm (UVB). In other words, this pigment screens out UVB and UVC rays, acting like a pair of sunglasses. In addition, if you’ve ever used yellow-tinted sunglasses, you may have noticed that they tend to increase colour contrast by removing or reducing chromatic aberration (colour haze) caused because different wavelengths (colours) of light are focused at different points in the eye. This pigment was first documented, quite accidently, by Gordon Walls in 1930 while he was dissecting a freshly-killed python. In a short communication to the journal Science some ten years later, Walls reported that the pigment was present in the lenses of the albino and normally pigmented Grey squirrels he studied. How beneficial this pigment is to albinos, given that it only absorbs UV and not visible light, remains to be understood, but it probably helps improve visual clarity, even though albinos are likely to be prone to being dazzled in bright light. So, if albinos are more susceptible to vision defects and, along with non-albino white morphs, run a higher risk of being spotted by predators, does being white confer any advantages? Well, to the best of my knowledge, there are no data to suggest there is any difference in fur length or anatomy in white and wild-type morphs. Conceivably, given that tree squirrels don’t hibernate, in areas where snowfall is common during winter, a white morph might have a selective advantage over a grey or red morph by standing out less against a snowy backdrop. In many cases, however, the reason populations of white squirrels, albino or otherwise, persist has a more obvious cause: humans. Towns in the USA where white squirrels are commonplace (e.g. Brevard County in North Carolina, Marionville in Missouri and Olney in Illinois to name a few) tend to be fiercely protective of their pallid rodents – indeed the squirrels are veritable tourist attractions. This human protection means that, for a squirrel, being white is beneficial. In conclusion, we have seen that the colour morphs of squirrels are under genetic control; they’re a result of changes (mutations) to the gene(s) responsible for producing and/or distributing melanin in the body. In some instances, as in the case of albinism, these colours come with physiological and/or biochemical downsides and at times they may make the animal more conspicuous to predators. Nonetheless, in certain environments some colours seem to be advantageous, so the traits remain. Where morphs exist outside of these environments, they do so presumably because either being a given colour doesn’t put them at a competitive disadvantage or because humans select for the colour.